Matt 12:9 And departing from there, [Jesus] came into their synagogue. 10 And behold, a man who had a withered hand was there. And they asked Him, saying, Is it lawful to heal on the Sabbath? so that they might accuse Him. 11 And He said to them, What man will there be among you who will have one sheep, and if it falls into a pit on the Sabbath, will not take hold of it and lift it out? 12 Of how much more value then is a man than a sheep! So then it is lawful to do well on the Sabbath. 13 Then He said to the man, Stretch out your hand. And he stretched it out and it was restored, as sound as the other. 14 But the Pharisees, going out, took counsel against Him as to how they might destroy Him. Psalm 8:2 Out of the mouth of babes and sucklings You have established praise because of Your adversaries, to still the enemy and the avenger. 1 Cor 15:29 Otherwise what shall they who are baptized for the dead do? If the dead are actually not raised, why then are they baptized for them? Mark 16:16 He who believes and is baptized shall be saved, but he who does not believe shall be condemned. Deut 6:6 And these words, which I command thee this day, shall be in thine heart: 7 And thou shalt teach them diligently unto thy children, and shalt talk of them when thou sittest in thine house, and when thou walkest by the way, and when thou liest down, and when thou risest up. 8 And thou shalt bind them for a sign upon thine hand, and they shall be as frontlets between thine eyes. Judges 6:4 And Deborah, a prophetess, the wife of Lapidoth, judged Israel at that time. 5 And she dwelt under the palm-tree of Deborah between Ramah and Bethel in mount Ephraim; and the children of Israel came up to her for judgment. Matt 10:32 Every one therefore who will confess Me before men, I also will confess him before My Father who is in the heavens; 33 But whoever will deny Me before men, I also will deny him before My Father who is in the heavens. I am on the right end of the 3rd row. First, let me say what I mean by "Orthodox Jewish". We belonged to an Orthodox synagogue in northwest Baltimore. In northwest Baltimore at the time I grew up, almost everyone was Jewish. We rarely saw someone who was white and non-Jewish. We kept some rules strictly, such as dietary laws, but we worked on the Sabbath, and we only went to synagogue if we got off of school. There was a rule, "If you don't go to school, then you have to go to shul". "Shul" is what we called synagogue. 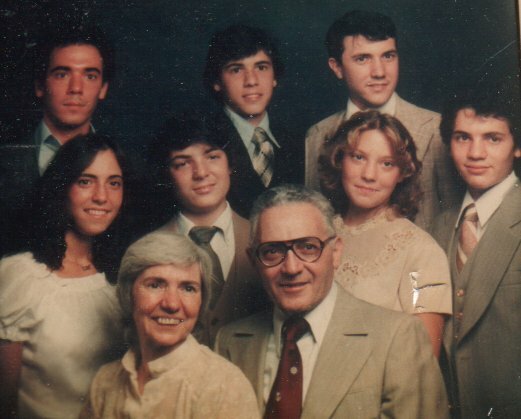 My Mom very much wanted her children to keep the Sabbath, and we celebrated it ritually at Friday night dinner, but she couldn't stop us boys from working on the Sabbath because my Dad worked on it. Partly this was because my Dad could not see wasting time that could be spent working. But I think the main reason is that he was terribly offended by the way his father practiced it (Matt 12:9-14). When my Dad was a boy his family had a loyal German Shepherd dog named Buffy. One Friday the dogcatcher caught Buffy and put him into the dog pound. If you did not pick up the dog the next day, the dog would be gassed (killed). My Dad urged his father to go to pay the fine to get Buffy out of the dog pound before it was too late, but his Dad refused. It would soon be twilight, and they could not possibly finish the matter before the Sabbath began. So Buffy was gassed. I think my Dad decided at that point that this could not be of God, and therefore the Bible must not be true. However he still strictly kept the other religious rules he had been taught. When I asked my Dad why we did certain things, such as wear a yarmulke whenever we ate, he answered, "Because my father did it, and my father's father did it, and my father's father's father did it ....". I said, "Why did our first father do it?" My Dad said that he didn't know. I did not think that was a good reason for doing something. My Mom would say, "The ancient sages were much wiser than we are, and we have to do what they taught." I did not think they were that wise that we should follow them blindly. 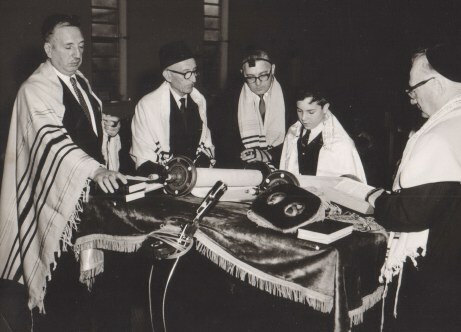 My Bar Mitzvah. That is me reading from the Torah. My Dad is to my right, and my Dad's father is on my Dad's right. The Baltimore City Treasurer, Hyman Pressman is on my left. My Mom's Dad had passed away before this. The obvious black box on my Dad's head is a phylactery. My Dad still puts one on every morning and reads from the Torah. I did for a short time. Everyone in the picture, including me, is wearing a phylactery, but you can't see it because it is black on black hair or is against the black background. A phylactery is a small leather box with a piece of the Torah parchment inside it that is supposed symbolize that the Lord's word is a frontlet between the eyes. (Deut 6:6-8; 11:18) There is also one on the left arm so that it is near the heart. 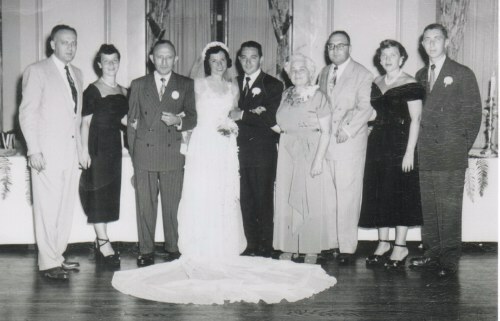 You can see the leather straps around my Dad's left hand. them on electronic tracks. One Friday, Jeff and I saw a $100+ HO scale track set reduced to $5 at Hect Company because the box had been damaged. We ran home from Reisterstown Road Plaza to get our money and buy it before anyone else did. By the time we got home, it had started to be twilight, and my Mom pleaded with us not to buy anything on the Sabbath. She told us that if we waited until Saturday evening, God would bless us for keeping the Sabbath, and the race car set would still be there for us. (This was her father's experience. He became extremely successful in business, yet never worked on the Sabbath. When he was young, every Friday he would get fired from whatever job he held because he would not work past Friday sundown. That forced him to start his own businesses, and by the time he was 30, he was one of the most successful entrepreneurs in Baltimore.) We said, OK, but if that race car set is gone, we will never keep the Sabbath again. As soon as Saturday evening came, Jeff and I rode our bikes as fast as we could to the Hect Company. The race car set was gone. We kids never abstained from buying or working on the Sabbath after that. I got saved my junior year of college, when I was 21 years old. Neither my father nor mother criticized me for this at first. This was because my parents were very worried for me. I had been sheltered, and always did extremely well in school and in Hebrew school without much effort. But when I went away to college I got caught up in smoking dope and that damaged my mind and dissipated my energy. My junior year I could not pass any engineering or science class. That is when I got saved. I thought at the time that my mind had been burned out. I couldn't focus enough to read even one page of a textbook. Neither could I pay attention enough to get anything out of class. I took a semester off and tried to get a job instead of going back to school, but everyone told me that since I had completed 3 years, I should go back to get the degree. So I felt before the Lord to go back to school. I told the Lord that I would attend all my classes and do all my homework. I also would wake up reasonably early, the same time each day, and go to bed at around 11 PM each night. I was hoping to get C's and graduate. When I did this, I mostly got A's and a few B's. I also did not miss any church meetings. I was inspired by the example of my mother's father. Just as he had not worked on the Sabbath, and trusted God would bless him, I decided that for me, as a Christian, the church meetings were a time of enjoyment consecrated to God, and I would not miss them because of homework. My parents saw that my giving my life to Jesus had diverted me from self-destruction, so they did not criticize me for believing in Jesus until after I graduated. I shared the gospel with my family. My youngest brother, Scott believed in the Lord right away, and stood up to persecution from the rest of my family. My mother listened to me patiently, and followed me in prayer to ask the Lord Jesus to forgive her of all her sins and to live in her, but I did not see a change in her life. I thought that she did not really receive the Lord, but was just trying to sympathize with me. 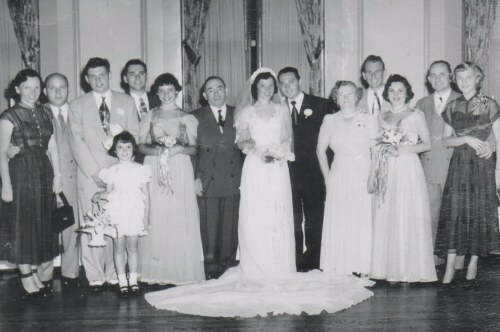 My parents' wedding with my Dad's family. statue of Mary. I was flabbergasted! We were orthodox Jews. I told her, No! That is an idol. She said, OK. Actually she had already bought the statue and thought that I would approve of it because I was a Christian. When I came home at Thanksgiving, there was that statue in the living room. It was horrible, with a snake on Mary's feet. I said, "Mom, Why did you buy this thing?" She said, "The price was too good to pass up. I can sell it for more than I paid for it." I told the Lord that I didn't want that idol corrupting my family. The idol was of 2 parts, a base, and the statue itself. I took it out into the driveway and smashed the base. My Mom heard the smash and came running outside to see what had happened. She said, "I didn't know you felt so strongly about it." Then she took the remaining part of the statue right away to a flea market and had it sold. When I graduated from college, then my Dad thought he would straighten me out, and tell me that Christianity was just a religion made up for people to make money. At the time, he thought he knew all there was to know about Christianity, and he knew almost nothing. My Mom had some Chabad rabbis visit me both at college when I was in grad school and when I came home to Baltimore. When I was in Baltimore, my Mom told me that the Chabad rabbis had told her that they needed to kidnap me in order to un-brainwash me, but she would not consent to that. In 1990 my Mom was dying of gall bladder cancer. She was 71, and had just about never been sick. I took some time off work and went to Baltimore to help take care of her. I would read the Bible with her most days, and when I returned to Detroit, I would call her and read the Bible with her. I would pick parts of the Old Testament that spoke of Jesus, like Isaiah 53. In about 6 months, she became very weak. She couldn't talk and could just sip a few teaspoons of carrot juice. I brought my family to Baltimore to see her. Before going, I had talked to our department secretary at work, Susan Moll, about my Mom. Susan exuded the love of the Lord. She told me that she had a Jewish-Christian friend in Baltimore and that this friend was experienced at sharing the gospel with Jews. I thought that would be good to have someone other than me share the gospel with my Mom. When we were in Baltimore, I asked my Mom if a Jewish-Christian sister could come over to share the gospel with her, and she nodded, yes. My wife and I picked up the sister and brought her over my Mom's house. I had to plan it carefully so that my sister, would not be over my Mom's house at the time because she was very opposed to my Mom hearing the gospel. My Dad was tutoring someone in math in the dining room at the time, and otherwise the house was empty. The sister started sharing the gospel with my Mom. She started to ask my Mom if she wanted to receive Jesus into her heart, and just then a car pulled into the driveway. In walked my sister, and she immediately perceived what was going on. She started screaming as loud as she could, shouting in the face of the Christian sister, and crying for someone to help her throw us out of the house. My Dad had to stop his tutoring and come to the den, where my Mom was to find out what was the emergency. He saw what was going on, and he said quietly to the Christian sister, "You are causing all this trouble. You will have to leave." We started to leave, and then we heard some noise coming from my Mom. Everyone became silent and listened carefully. My Mom was saying in a whispering voice, "Let her stay. Let her stay." Then the sister went over to my Mom, and in front of everyone shared the gospel with my Mom again. Then she asked my Mom, "If you want to receive Jesus as your personal Savior, nod your head, Yes." My Mom nodded, Yes. She asked my Mom, "Do you believe that Jesus died for your sins and rose from the dead?" In front of everyone my Mom nodded, Yes. Here the Lord had arranged it much better than I had planned. If my plans had worked, then my Mom would have received the Lord in secret, and I would still have doubts that maybe she did it just to please me. But here she confessed the Lord in front of my Dad and sister (Matt 10:32), both of whom she believed would be very opposed to her believing in Jesus. Then my Dad went back to his tutoring and my sister left. I asked my Mom if she would like to be baptized. She shook her head, No. I tried to explain to her the importance of being baptized, but she whispered that my Dad would not like that. 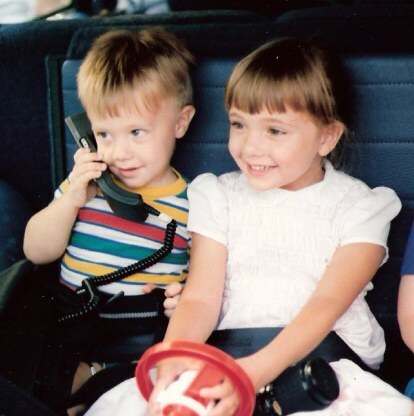 My son Isaac at age 4 and daughter Ruth at age 7. This picture is in my sister's car during the very trip when Isaac spoke words of wisdom. were staying while in Baltimore. My sister was in the kitchen with my 4 year old son, Isaac, who was eating a bowl of Cheerios. My sister really liked Isaac. He and her youngest son had a natural affinity for eachother. When I entered the house, my sister released her fury at me, "You are so bad! What you did was so low! You are just the worst!" Isaac exclaimed, "Dad, What did you do?" He said it loud and with so much expression that my sister became quiet to listen to him. I said, "We preached the gospel to Grandma Miller. " Isaac thought a little and said, "To preach the gospel to Grandma Miller? That is not very bad. Actually, that is very good." He thought a little more and then said, "Actually, to not preach the gospel to Grandma Miller, that is very bad." My sister was silent (Psalm 8:2). At my Mom's funeral, My Dad told me, "Steve, do you remember when Mom was sick and had a fever, and you called her and read the Bible with her?" I thought he was going to tell me that I shouldn't have done that because that wore her out. Then he continued, "Before you would call, Mom would have a fever. After you called and read with her, her fever was gone, and she felt much better." Later, I realized that when my Mom had prayed with me when I had first been saved, she really did receive the Lord then. When she had bought that Mary statue, it was because she actually believed in Jesus and thought that is what she should do. A few years later I went to synagogue with my Dad and some of my brothers. This is a new kind of modern orthodox synagogue with modern speakers. The speaker was a visiting scholar-rabbi from New York who is also a secular novelist. He was speaking on Jewish ignorance. He said that Christians are more knowledgeable of their religion than Jews are of Judaism. He asked who knew the answers to some Bible questions. Some were trivia, some were major. He asked who knew that the kingdom of Israel split into 2 parts after Solomon's death over the matter of taxes. This was a major fact of the Bible and very few knew it had even happened. He also asked who knew the name of Moses' mother. Some people stood up including me. The he said, It is not Miriam, and 2/3 of the people sat down. (If he had then said, It is not Zipporah, the others would have sat down too.) Then he said, I have a more difficult question for you, Is it better to do a commandment of the Lord because you want to do it or because it is a commandment of the Lord? A number of people stood up to answer including me. Everyone that he called on said, It is better to do it because you want to. Then the rabbi said, Why then did the sages say that it is better to do it because it is a commandment of the Lord? Everyone sat down except for me. My brother put his face in his hands ashamed of what I might say. The rabbi called on me, since I was now the only one standing, and I said, "If a person does something because he wants to, you can't depend on him to do it. But if a person does it because God has commanded it, then you can depend on him to do it." The rabbi looked angry. He stretched out his arm and pointed at me and looked all around the large sanctuary, saying loudly, "That answer! That answer! That answer, I believe is the very answer that the sages had in mind!" The other rabbis on the stage started standing up to get a look at the person who had given that answer. My Dad was very proud. As we left the synagogue, my brother Scott said to me, "Steven, what that rabbi said was true. Jews are ignorant of the Bible. No one knew the answer to many of the questions except for you, and that is because you are a Christian." After the service, my Dad said to me, "Steven, you are the best Jew I know." I said, Why? He said, "Like the rabbi said, Being a Jew is not mainly about religious rituals but about morality." I said, How have I been moral? He said, "The way you took care of Mom when she was sick." Actually, I didn't do much because I live in Detroit and the rest of my family was in Baltimore, but that's what he said. I then tried sharing with him about Isaiah 53, but he wasn't open. For years, I was still bothered that my mother had not been baptized, but I wasn't really conscious of it. One day I was confessing to the Lord, and I told Him that I felt that I had failed because my mother did not get baptized, and I was afraid she may have to suffer because of that (Mark 16:16). Then a verse came to me, 1 Cor 15:29. Brother Witness Lee had shared that this meant that some Corinthian believers had been baptized for other believers who had died before being baptized. This made sense to me, since it could not possibly mean, as the Mormons teach, to be baptized for dead unbelievers, because that would contradict the basic teaching of the New Testament (Mark 16:16). However, I had never heard of anyone practicing this. At one of our church's young peoples' retreats, where a lot of young people get baptized, I also got baptized for my Mom according to 1 Cor. 15:29. I have been peaceful about that ever since.